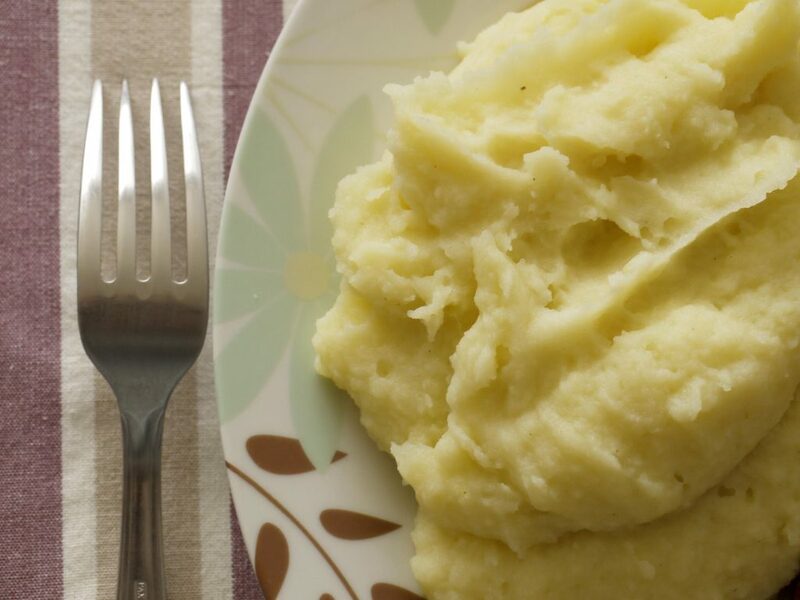 Choose higher starch potatoes (like Russets or Yukon golds) for the fluffiest, smoothest, and most flavor-packed mash. Waxy potatoes (such as red or white varieties) require more mashing to become creamy, which could lead to overmixing your potatoes resulting in a pasty/gluey consistency. Start the boiling process of your potatoes using room temperature or cold water. This helps bring the internal temperature of the potatoes up with the water instead of cooking the potatoes from the outside in. This is critical in ensuring your potato is evenly cooked vs overcooked on the outside and undercooked in the inside. For dairy-free mashed potatoes, simply substitute stock for milk and bacon fat for the butter. Your taste buds will be tingling! Add potatoes to a large pot. Cover with room temperature water and a sprinkle of salt. Bring potatoes to a boil and cook until soft. Meanwhile add the stock, rosemary sprigs and garlic to a medium saucepan. Bring stock to a simmer and reduce by ¾. Strain potatoes and mash using a whisk or potato masher. Add butter and strain in half the hot stock mixture. Season with salt and pepper and mix until smooth. Add more stock if need be.